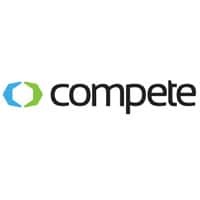 The level of positive responses to a new survey of US consumer attitudes to NFC mobile payments represents a “significant volume… beyond the level we’d call early adopters”, says Compete. One in four Americans is already prepared to pay for groceries using their mobile phone instead of a debit or credit card, despite a continuing fear over the security of mobile phone payments, new research has revealed. Meanwhile, one in five consumers said they would be likely to pay for clothes, phone charges, and coffee with their phone instead of a card, while 20% would use their phone to redeem coupons. 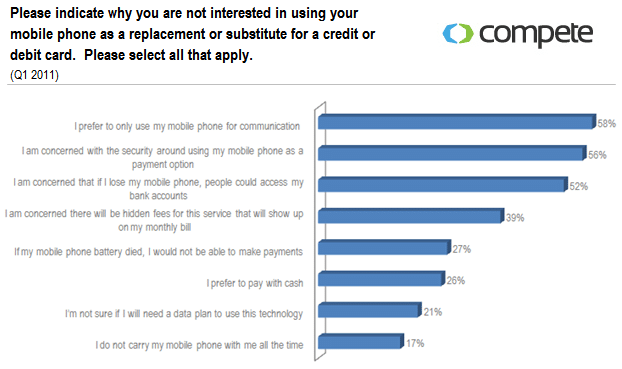 More than 51% of respondents reported using their phones for mobile banking, up from 40% in the third quarter of 2010. 45% of smartphone owners used their phones to view their bank account status. Simple preferences and fears over security were the main drawbacks for those who were not interested in using their phones for payments. Other responses included concerns over hidden fees, worries about excessive battery use and a preference for using cash. Specifically, 58% responded that they preferred to only use their mobile phone for communication (calls, email, or text) while 56% indicated they were concerned with the security of using their phone for payments and 52% were concerned about security if they lost their phone. “Providing consumers with enough incentive to gain experience with the technology as well as increasing messaging about the security of mobile payments will be two key areas to address in order to encourage further adoption,” says Compete.